“Therefore, from now on, we regard no one according to the flesh,” (2 Corinthians 5:16); Is this what the appearance mentioned above is about? Do we see each other in this way? Do I see myself in this way? 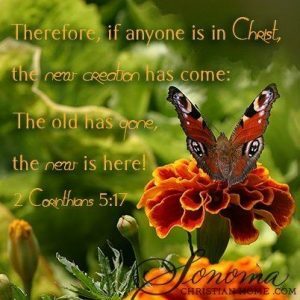 Is it possible that the old has to do with external appearances of a life lived for self and the new has to do with the internal condition of the heart and a life lived for Christ? If so, then why do I struggle with the realities of the external when supposedly I am new on the inside? Might one clue be found in 2 Peter 1:9 where the writer states that when I forget my past sins have been cleansed, I become nearsighted and blind? So, might remembering this reality help me see more clearly the new that has come – which is Jesus Christ in me the hope of glory now? Holy Spirit, would you help me to remember that the old has gone and the new has come? Would you help me remember that my past sins – that which is old – have been cleansed and the new, your life in me now, has come? Allow this reality to be the ground from which I live and move and have my being. Let this truth be how I see others as well as myself, as redeemed, renewed, cleansed, restored, made whole and beloved in Christ. Let this mindset be the mindset from where I engaged my life circumstances and those whom you have placed around me. Would you open the eyes of others so they too can see themselves as you see them and together may we be drawn closer to you as we lift up your name for all people to be drawn to you? In Jesus I pray, amen!